My second day at the Men’s Clay Court Championship was, unsurprisingly, almost entirely different from my first day there. One thing that remained the same was that I arrived to the River Oaks Country Club a little later than I wanted. The first qualie matches started at 10:00 a.m., but I parked my car at around 10:15. Once again, I decided to take a shortcut on my way to I-45 … and once again added 10 minutes to my drive. This time it was purely out of bad luck, though: right before a problematic intersection three police cars blocked one of only two lanes in order to deal with a fender-bender. No escape was possible. When I arrived at the grounds, I realized that I like Houston as much as I do because I don’t have to commute to the Downtown area every day. Once I got to the event, it was evident that I was in store for a different experience than the day before. For starters, there were a lot more people walking around the grounds. 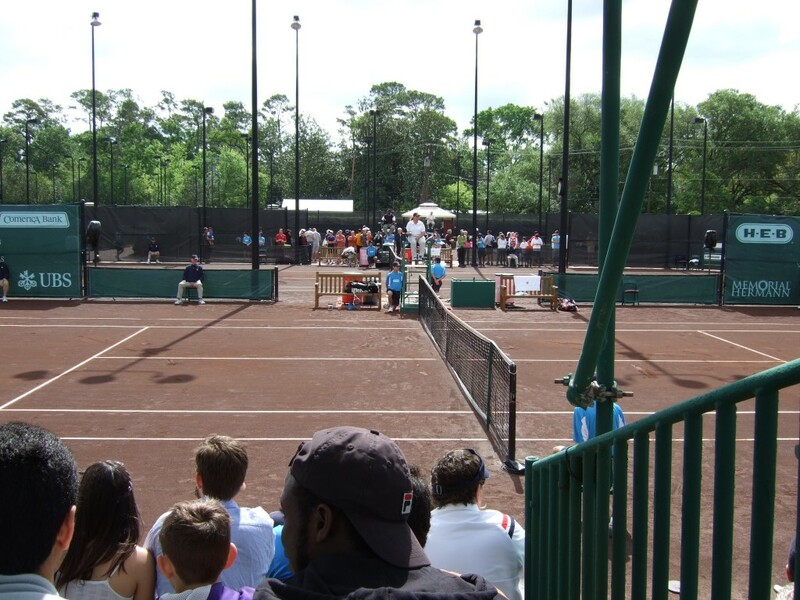 I was glad to see so many tennis fans turn out for the first round of qualifying, a direct result of the Houston ATP 250’s decision to do what other smart tournaments do and open its doors to anybody who wants to watch some live tennis during the first two days of the qualies. I also found it encouraging to see plenty of young people were out there catching the live matches as well as the practices. The weather yesterday might have been the same as Friday, but it certainly played a different role. The glorious spring day yesterday in Houston reminded me a lot of the conditions of my hometown of Quito, Ecuador (nicknamed the “city of eternal spring”): the high was in the mid 70s, and it was sunny for most of the day. A light breeze went by every now and then, and if you were in the shade, nicer weather couldn’t be imagined. But if you were out in the sun … that was a whole different story. Just as it is in my home town, where if you venture outside at noon on a sunny day, you will feel your skin start to fry like a chicken wing. The sun in Houston was not gentle today. Add to that my silly mistake of not taking a hat with me, and you arrive at my condition at the end of the day: slightly sunburned, and quite out of it. As I said, Court 3 was nice and comfortable. The problem came if you wanted to watch any of the tennis taking place on Courts 4 and 5. The only feasible place where you could do so was a somewhat narrow corridor between those two courts that didn’t have any seating or any shade. A testament of the interest in today’s matches was that the corridor was pretty much packed all day. The great thing about attending during the qualifying weekend is that not only can you catch the qualifying action, but you can also see the big names practice. There were quite a few people sitting at the Stadium Court to watch James Blake practice. I went into the Stadium to catch a little of his practice before heading to the outer courts. A finalist here in 2008, Blake was crushing the ball. The clay here doesn’t make the ball jump up at all, so it sets up nicely inside Blake’s low strike zone. 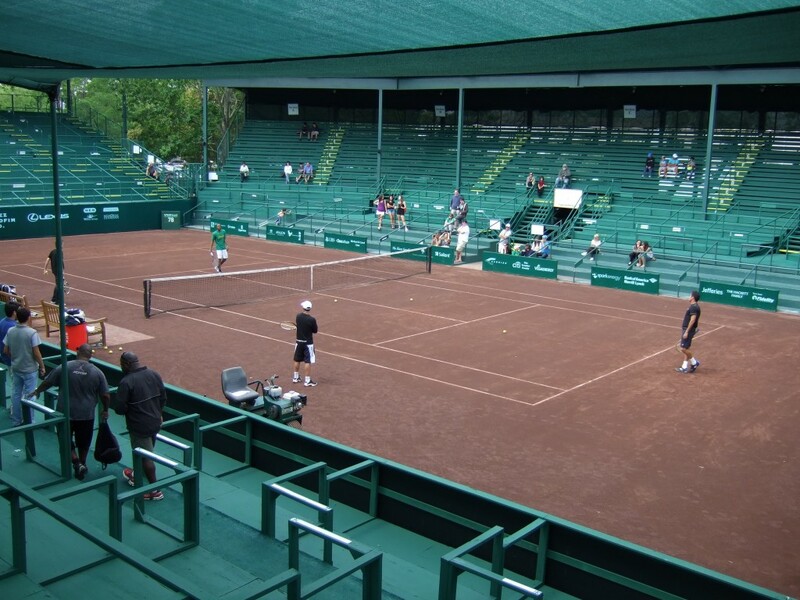 I’m more and more convinced that the strange dark red clay of the River Oaks Country Club plays more or less like the recent World Tour Finals: a slow surface with a low bounce. At any rate, I did want to catch some of Robby Ginepri’s first round qualifying match, so after I stopped by the media center to say hi to Pete Holtermann (the Media Director for the event) and María García-Planas (the ATP PR point person for the tourney), I headed out to Court 3 to catch a glimpse of a former US Open semifinalist. The young American (only 18 years old) was unlucky to draw a seasoned pro like Ginepri. Someone who’s played almost 400 tour matches will surely expose the frailties of your game. Regardless, Philips showed some flashes of brilliance, and his one-handed backhand was a welcome sight. However, the lack of experience ended up costing him dearly. Many times he was up 40-15 on his serve and ended up getting broken. However, Philips did manage to get the crowd behind him, even if he ended up losing 2-6, 0-6. After Ginepri clinched the second set bagel, I made my way to that crowded aisle between Courts 4 and 5. There I saw the man with the second-best name of the qualifying tournament: Michael Venus, from New Zealand. He was playing Frank Moser, who was wearing a white tennis shirt that had “Franky” printed on the back. The men seemed to be engaged in a death match of sorts: their match was just entering a second set. After watching a few games I retreated back to Court 3, since Gerald Melzer, Jürgen Melzer’s 22-year-old brother, was set to start his match against Alex Kuznetsov. (As an aside, this moment is when I realized that I had made a stupid mistake by not bringing a hat. Or wearing sun screen). Gerald Melzer, as you can imagine, plays a very similar brand of tennis than his famous older brother. He’s a lefty, too, which accentuates these similarities. 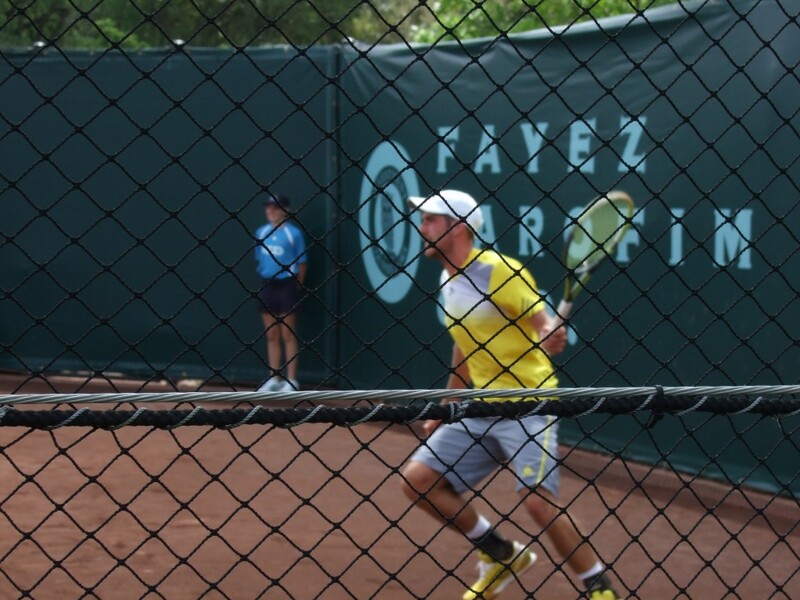 Melzer started the match slowly, mistiming a few balls and failing to get much pace and depth on his shots. However, little by little, the younger Melzer started to gain confidence, and everything in his game started to look better. His forehand began to click, and he used it to great effect to boss Kuznetsov around. Gerald also used a nifty cross-court backhand with nasty angles to turn the balance of points in his favor. After he took the first set, it was clear that Jürgen’s brother was the better player on Court 3. While on the stands, I noticed that on the clay courts behind Court 4 there were some pros practicing. I could see Rubén Ramírez-Hidalgo and Ivo Karlovic, who had to share the court with two others. Since Gerald Melzer seemed well on his way to a straightforward win, I walked over to the practice court to see if I could catch one of the great serves in tennis history. Dr. Ivo is a very, very tall man. And his serve is just ridiculous. The winner of the 2007 Men’s Clay Court Championship seemed pretty relaxed, and he was hitting the ball very well. It was funny to see four pros share the court, but given the fact that there are only seven clay courts in the country club (including the Stadium Court), guys have to find ways to share the available ones. Along with Karlovic and Ramírez-Hidalgo, Flavio Cipolla was there, as well as someone I couldn’t recognize. The kids also alerted me to the fact that Fernando Verdasco was practicing on the court behind Court 5. Just before I made my way down there, I saw a familiar face: Jamie Murray. I headed over to catch some of Verdasco’s practice. The man who played a huge part in the best tennis match I’ve ever seen was wearing long sleeves and hitting with someone I couldn’t place. Their practice was over a few minutes after I arrived there, so I decided to head back to the media center to see if I could catch some of Venus-Serena match from Charleston. Pete Holtermann was a step ahead of me, and he had set up an iPad next to his laptop with the stream. Just as Serena took a decisive 4-0 lead in the first set, I figured that the duo’s match would be rather straightforward, so I went to the Stadium Court to see if any of the big names were there. 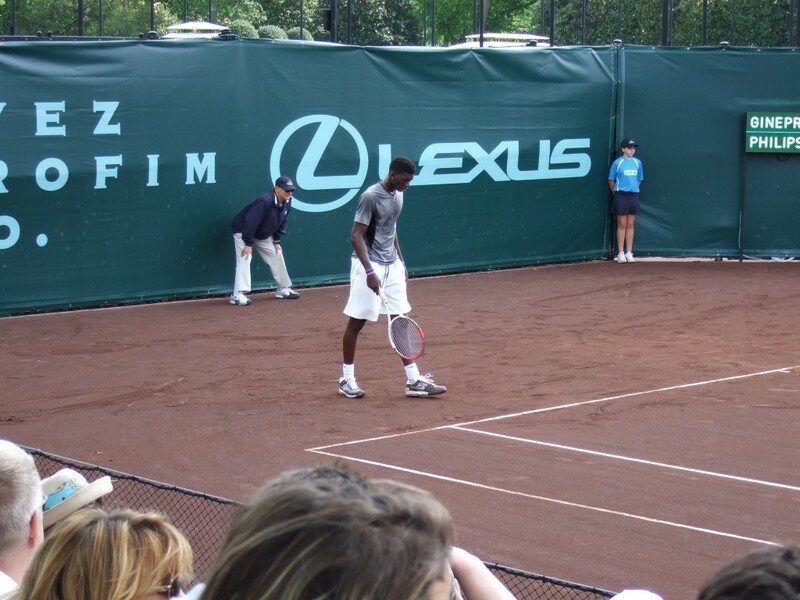 Two of them were warming up for a practice set, in fact: Nicolás Almagro and Gaël Monfils had attracted a few people. These folks had realized that this was a pretty fantastic opportunity to see two top talents from up close and personal. However, I had already seen Almagro practice, and since they were just starting, I figured I could come back later. I was intrigued by the two things out on the outer courts: first, the third match on Court 3, featuring Connor Curry, another Texas junior. Curry will graduate from high school next year, and he was facing someone almost 10 years older than him: Greg Oullette, from Florida. 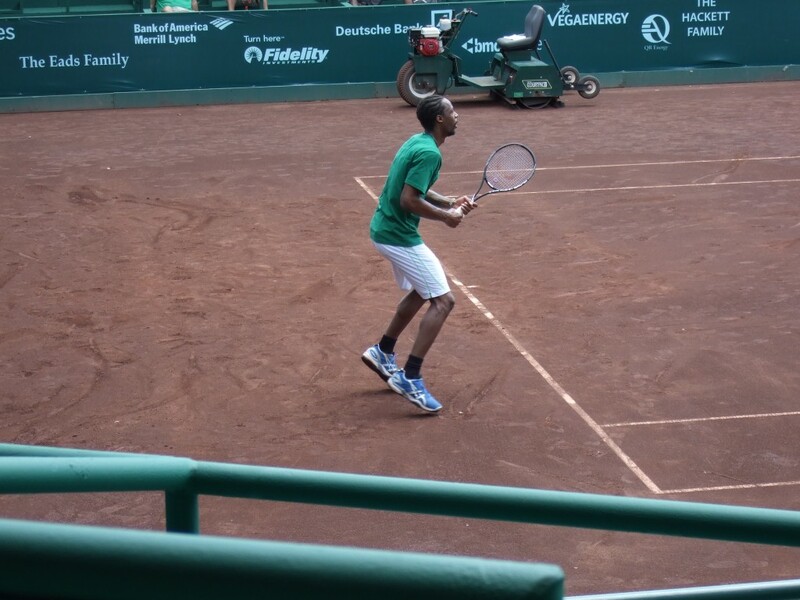 But my main interest was the second match on Court 5, featuring Takanyi Garanganga, who is from Zimbabwe. How often do you see a tennis pro from that embattled African nation? I made my way to that crowded aisle between courts 4 and 5, and watched the first few games of Garanganga’s match against Scott Lipsky, who is better known as the 26th-ranked doubles player in the world. It was clear that this was going to be a match of contrasting styles: Lipsky wanted to use his experience to out-maneuver Garanganga, while at the same time trying to guard himself against the power of the 22-year-old Zimbabwean. I really would have loved to stay and watch more of this match, but the lack of shade made it pretty difficult. Again, not bringing a hat was a costly mistake. I made my way to Court 3 to catch some of Curry-Oullette, as well as some much needed shade. The teenager from Wichita Falls was impressive, though tiny. He has a natural feel for the ball, and his shots look solid. However, Curry was playing against someone much older than him, and with age comes experience and consistency. Curry fought hard to stay in the match, but Oullette clinched a straightforward victory. At the end of this match I got a chance to meet Craig O’Shannessy (via a sort of Twitter-introduction by our own Amy Fetherolf – welcome to the 21st century, no? ), who will be familiar to those who enjoy his Brain Game posts on the ATP World Tour site as well as on the New York Times Straight Sets blog. It was interesting to see him unmount a camera he had set up on the wall behind one of the Court 3 baselines. Craig is helping Connor Curry’s development, so it wasn’t a surprise that he was gathering information on this match. We talked stats for a bit, and then I went back to the Stadium Court to catch the end of the Almagro-Monfils practice set. Just as I climbed the stairs that lead inside the Stadium, Gael Monfils produced one of his trademark unnecessarily spectacular overhead smashes that drew awe-inspired gasps from the crowd. 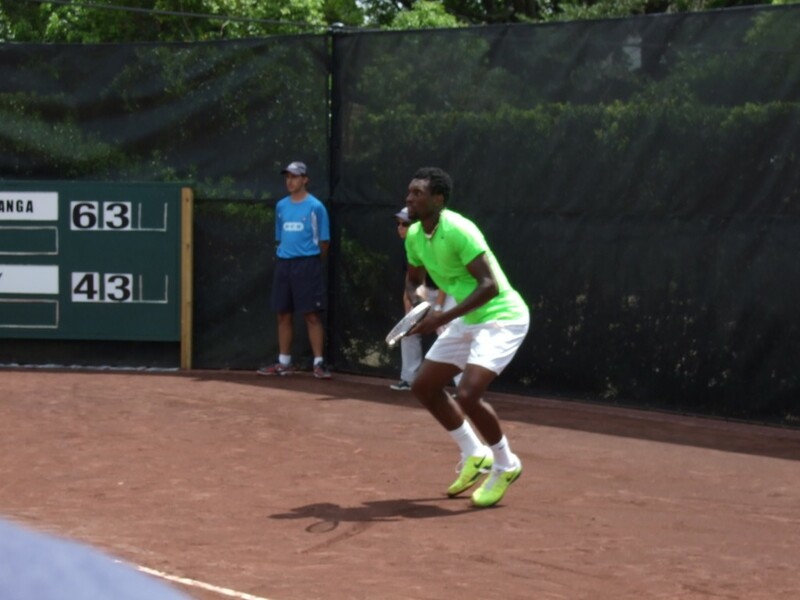 Monfils is a natural entertainer, and he really can’t help himself in these scenarios. Unfortunately for Monfils, Almagro dominated said practice set with ease. Nicolás is hitting the ball extremely well at the moment – far better than anybody I’ve seen so far. But not to worry: an exasperated scream once again came out of his mouth when he sent a short forehand into the net. The 12th-best player in the world absolutely hates missing those short forehands. In Almagro’s defense, the extra-edginess might well be due to the fact that he’s the top seed here in Houston. Almagro is also fully aware that he’ll have to be in great shape to face a tricky-on-paper match-up with either James Blake or Monfils in the second round. At any rate, Almagro easily clinched the practice set, and I went out to see some more of Garanganga’s match. The Zimbabwean is fun to watch: he has a big serve, and his shots have quite a bit of pace. His North-South movement is suspect, though: Lipsky was using the drop shot to great effect. The sun once again made me leave the court, and I decided to get lunch. The food vendor’s tent overlooks the golf course. I couldn’t have asked for a quieter setting to get some fuel in my body. At the table next to me, a little girl was excitedly telling her dad that she now could bounce the ball off her racquet without having it drop to the ground. Her coach was so impressed that he asked her to try twisting the racquet face between bounces. She was thrilled at her new skill. I knew I had to leave the grounds at around 3 p.m., so I ventured into the Stadium Court once again to see who had come after Almagro and Monfils. I was surprised to see Fernando Verdasco there: just a couple of hours earlier he had been practicing elsewhere. Can’t blame the Madrileño, though: he’s on a bad losing streak at the moment (hasn’t won a match since the Australian Open), so anything he can do to get some confidence back is more than worth it. Plus, Verdasco has a tricky opener against Steve Johnson, so he can’t really ease into the tournament. As I was heading out, I noticed that Nicolás Almagro, fully changed after his practice session, was walking towards me. The man from Murcia looked to be extremely focused, his thoughts clearly on something important and very serious. But just he came within five or six feet of me, an Argentine couple materialized out of nowhere and asked him for a photo. In the blink of an eye, Almagro smiled, and agreed to the fans’ request. Always a smart move by the top seed of a tournament.